Ever wondered what’s the difference between cacao and cocoa? Up until about a year ago, I had only heard of and used cocoa powder but as I’ve gotten more into experimenting with raw foods, I learned about cacao and it’s many health benefits. First, both products come from the cacao bean, grown in South American, and where we get chocolate from. Cocoa is usually ground up, sometimes dutch-processed and can include a bit of cacao butter in it to enhance the flavor. Cacao, on the other hand, is completely raw, sugar free and full of antioxidants. When I used to use cocoa powder, I’d always buy the Hershey’s Special Dark variety, since it was fuller in flavor than the regular version. But it was made from a mix of dutched and naturals cocoas, so it wasn’t quite as unprocessed as it could be, plus it wasn’t raw. 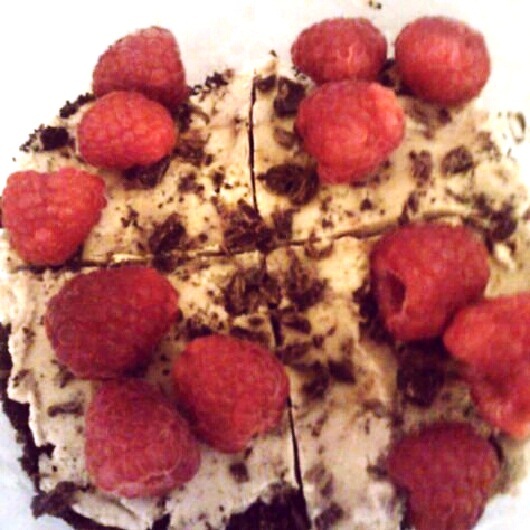 I discovered truly raw cacao powder after I had started making raw desserts. I’m obviously not 100% raw, so often my raw desserts aren’t completely raw, but I figured that switching to raw cacao would be beneficial. And I ended up liking the taste more. It was richer, more complex and actually sweeter, despite having no added sugar. It worked just as well in raw recipes, so I decided to switch to just using that, despite the slightly higher price tag (and I also was having a hard time finding the dark cocoa powder), because it has more iron and antioxidants than plain cocoa. Cacao nibs are also a favorite of mine. I love the Navitas Naturals brand (I get the cacao sweet nibs which are lightly sweetened with organic cane juice) because they’re fairly inexpensive and are a healthier alternative to dark chocolate chips. I eat them straight-up, in nut butter stuffed dates and use them in raw recipes. If you need a chocolate or granola fix, but are looking for something that fits into your clean eating or raw diet, I’ve got the perfect option for you…Crunchy Cacao Buckwheat Rawnola. It’s easy to make (you don’t even need a dehydrator if you don’t own one), has only 4 simple and healthy ingredients and is perfect for those chocolate and cereal cravings. Buckwheat is another superfood, and is actually not related to wheat at all. It’s gluten free, and not really a grain but a seed (like quinoa) so it has a higher protein and fiber content than many other grains. 1/4 cup of raw buckwheat groats has 6 grams of protein and 5 grams of fiber, which makes it a great option for vegetarians and vegans who want to bump up their protein content. The best part about this rawnola is that it’s oil-free and only has a bit of added sugar in the form of maple syrup, which is a lot better than most granola brands on the market. And you make it yourself, so you get to control what goes in it. So you can definitely change up the flavor profile, but having the raw cacao powder in there means more antioxidants and who doesn’t love chocolate? Drain water off groats and dry with a towel. Place soaked groats in a bowl and stir in remaining ingredients. The groats should be wet enough to soak in the cacao powder. Spoon cacao groats onto dehydrator trays (alternatively, you can put them in the oven on the lowest heat setting with the door open for a few hours) and let dehydrate at 115 degrees overnight, or at least 6 hours. Enjoy the rawnola with almond milk, over fruit or just plain. Makes 2 servings. What is your favorite ‘superfood’? Have you ever made granola with something other than oats? Recipe submitted to Healthy Vegan Friday #44 and Raw Food Thursdays. Most of my WIAW posts are a random assortment of food pics I happened to take through the week. But not this week, no, I was actually on top of things and managed to take a picture of everything (well, basically everything) that entered my mouth on Monday. 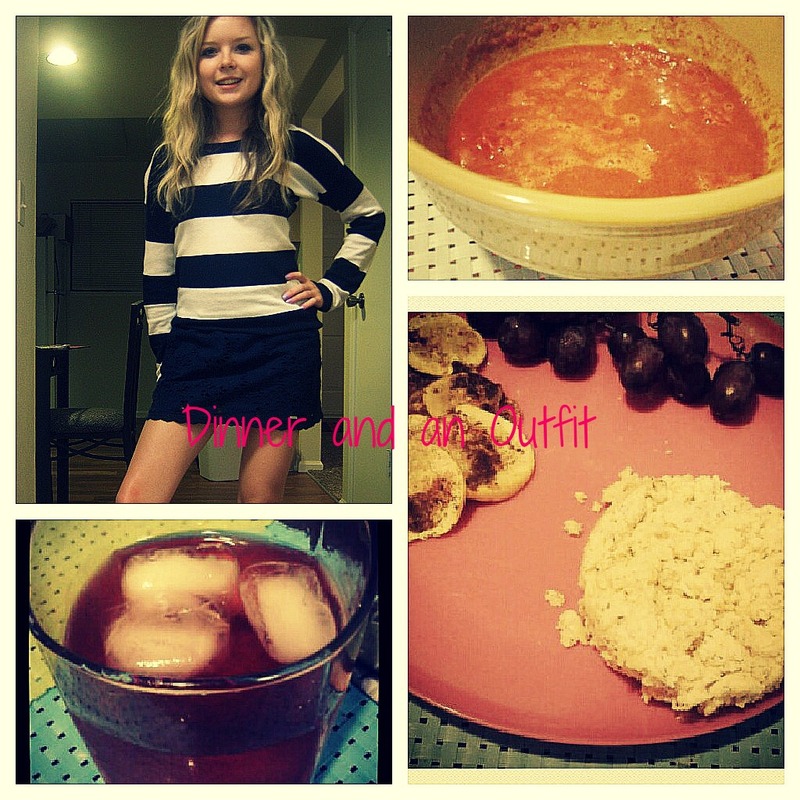 Plus I’ve got a recipe to share with you so it should be one of my better WIAWs in awhile. Let’s do it to it! [from left] Leftover pumpkin”water”. Pumpkin chip buckwheat waffle topped with real maple syrup, Vega chocolate protein frosting and pumpkin spice latte quinoa granola. Most people are either “pancake people” or “waffle people”. I am most definitely a waffle person. Not frozen waffles, of course, but I love whipping up a homemade waffle for breakfast. I like pancakes, but I am horrible at making them turn out perfectly fluffy and circular. So I’m sticking with waffles, which are more foolproof. Except that one time I tried making a coconut flour-based waffle and it got majorly stuck to the waffle iron. Let’s just say that vegan pancakes and waffles don’t work so well made with coconut flour. This waffle was amazing though and it didn’t get stuck to the iron at all. Win win. Yes, I am obsessed with all things pumpkin. But it’s even better combined with chocolate. [from left] Kelp noodles. Spicy peanut sauce. Shredded carrots. Steamed edamame. Alter Eco dark chocolate with quinoa crisps. Black Mission figs. Justin’s vanilla almond butter. 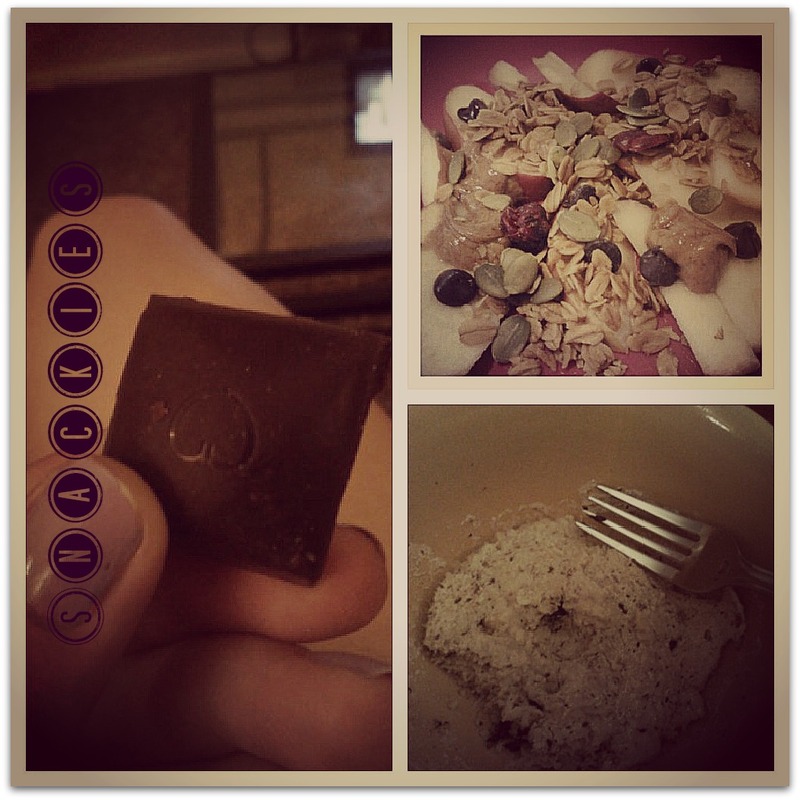 Lunch was faux stir fry with a side of figs dipped in AB and a square of chocolate. The stir fry was faux because it wasn’t really stir-fried but it tasted like a peanutty stir fry. Kelp noodles are amazing, because they totally soak up the flavors of whatever sauce you pour on them, and they are pretty similar to noodles, without the calories and carbs but with all the nutrients of sea vegetables. The chocolate, well, I swear, I can’t not eat chocolate in some form for most of my meals or snacks. It’s kind of a problem. Oh, and BTW, if you have access to fresh figs and Justin’s vanilla AB, please try them together. It’s a magical combo. [clockwise from left] Chocolove raspberry dark chocolate square. Apple nachos topped with Udi’s g-free cranberry granola, almond peanut cashew butter, chocolate chips, pumpkin seeds. Cookie dough inspired protein microwave muffin. Those apple ‘nachos’ are my favorite snack discovery. They are a million times better than regular nachos, obviously health wise, but they also taste great for being so simple. Basically you slice an apple (I used a Pink Lady, my fave) really thin, microwave it for 30 seconds and then top it with whatever you like. I went with drippy almond butter, chocolate chips, granola and pumpkin seeds. So. Good. And then there are the usual suspects, a microwave protein muffin (easy to make and a great way to get in some extra protein) and a square of one of my favorite chocolates. 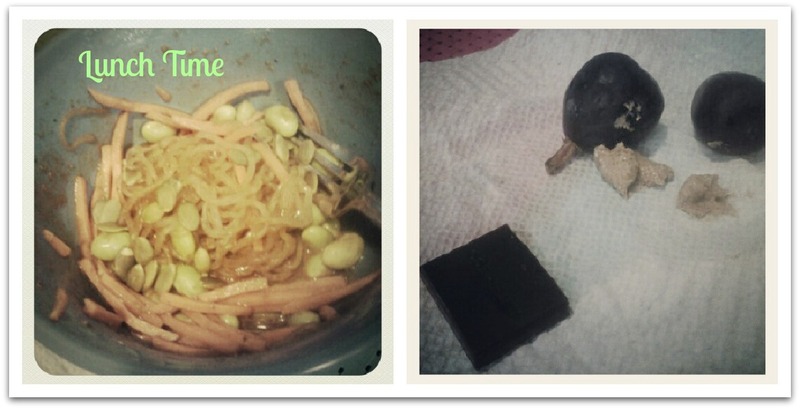 Missing from the pictures is a little bit of some dry roasted edamame I ate during my late class. 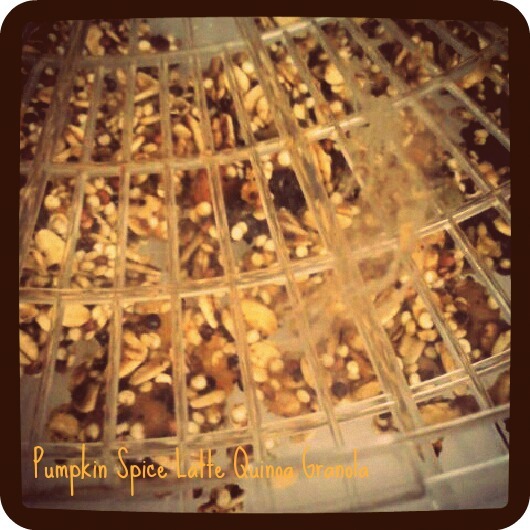 Almost raw granola inspired by a classic Starbucks drink. I was obsessed with making rawnola (raw granola) over the summer when I got my dehydrator. But since being at school, I’ve only lugged it out once to make some kale chips. That obviously had to change, since I missed homemade granola. Like everyone else, I’ve been loving pumpkin lately (which is weird ’cause I didn’t like it much last year) so I decided to make a pumpkin-y rawnola. If you don’t have a dehydrator, you can totally make this in an oven, set to a low temperature. In a large bowl, mix oats and soaked quinoa until combined. Add in coffee, raisins, nuts and any other mix-ins you’d like. Stir in agave and pumpkin until mixture is a little sticky and thick. Spoon granola mixture onto wax paper lined dehydrator trays (or use reusable dehydrator liners, if you have them) and dehydrate for 4-6 hours. Turn off dehydrator and let rawnola sit uncovered for several hours or overnight. Serve with almond milk or on top of fruit. Makes about 1 cup. [clockwise from top left] navy striped sweater (Hollister), navy lace pencil skirt (Gilly Hicks). Mom-made veggie chili. Spiced yellow squash, red grapes, giant corn coconut microwave muffin. Celestial Seasonings tropical iced tea. Like how I threw in a random outfit shot there? Yeah, it looks so dark ’cause I forgot to take one until it was already nighttime. Oops. Dinner on Monday was a winner, though. I reheated some spicy veggie chili my mom made a couple weeks ago and sent with me to freeze for future dinners. So if I can’t make it to the grocery store, I guess I’ll be set for a few days! Lately I’ve been loving yellow squash–I bought it randomly at Target and I can’t get enough of it sauteed with a little coconut oil and seasoned with chili powder and cinnamon. But the giant corn muffin was the best part of the dinner, obviously. I don’t know how it turned out so giant, I just made it with 2 tbsp of corn meal, 2 tbsp of coconut flour, some water, salt, stevia, baking powder and flax. Whatever, I’m not complaining. It was so good, especially for being thrown together, and it actually wasn’t too crumbly for a grain-free vegan microwave cake. Are you a pumpkin fan or not so much? Are you a waffle person or a pancake person? This post was submitted for Healthy Vegan Friday #10. We’re officially halfway through the year–wooooo! July is my favorite month for several reasons, one being that my 20th birthday is on the 27th, which also happens to be the opening day of the summer Olympics this year. I also really love the 4th of July, even though this year I won’t get to see any fireworks because of all the fire bans. Better safe than sorry though–all the fires here have been scary and I don’t want anyone else to lose their homes because of a careless mistake. And I just love July because it’s pretty much the height of summer–my favorite season. But backing up to June for the moment, here is my monthly recap of my favorite posts! I’m so tired of counting calories rather than enjoying my life. I won’t lie, it’s always hard for me to hit publish on my more honest posts, but it’s always worth it. I appreciate all of the comments you guys left on that post and I’ll be looking back at it often to remind me of why I’m choosing life over calories. This stuff is beyond yum! Sometimes the simplest things in life are the best. Since I posted this recipe, I’ve simplified it even more to just 3 ingredients and it’s just as delicious as the original 5 ingredient version. I’ve made it on a weekly basis and my dad even loves it, which is a testament to how good it is. 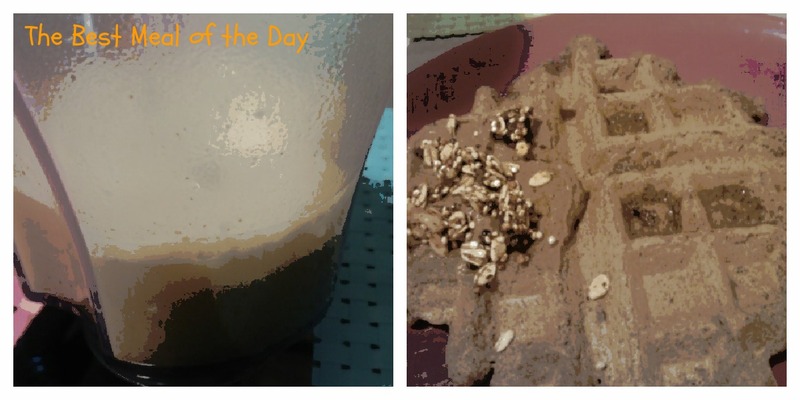 If you have oats, sunflower seeds and agave–make this now! Let’s just say I don’t fear coconut as much anymore. I’ve mentioned it periodically on my blog, but coconut has been fear food numero uno since my ED. However, since seeing coconut products all over the blog world, I’ve become more and more interested in trying it again. 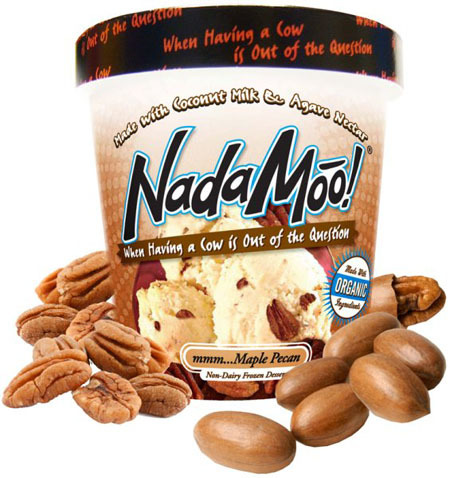 I finally conquered my fear and bought a pint of maple pecan coconut milk ice cream last week. From the first bite, I was in love. I still love my almond milk ice creams, but this stuff was beyond creamy, which is crazy for a vegan ice cream! Best part is, it’s sweetened naturally (with agave nectar) and all the fat is from a healthy plant source, coconut. Never again will I shy away from a coconut product! 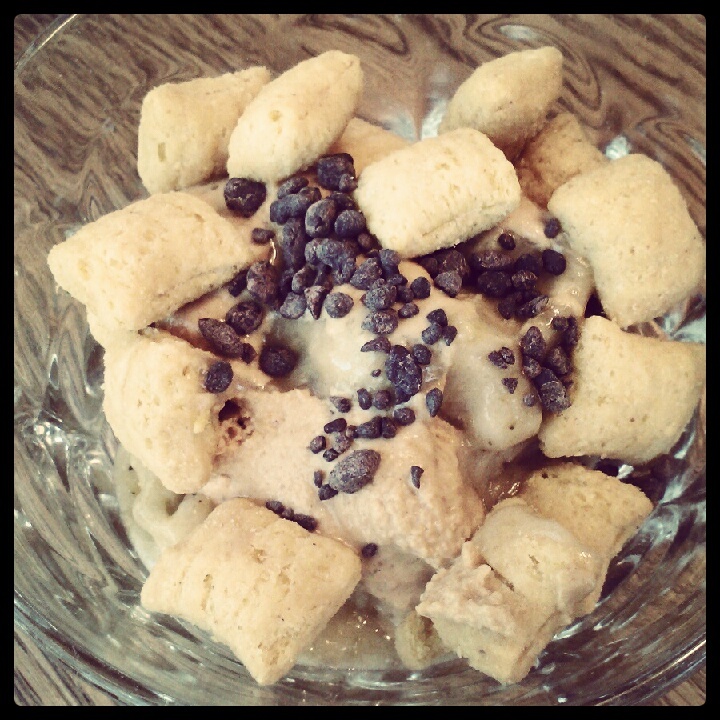 Looks like dessert, but is secretly packed with antioxidants and potassium! I love switching up my WIAW posts from the typical everything-I-ate-today kinds, and this was really fun to research all the health benefits behind some of my favorite foods. Look for another similar post soon! Do you like coconut or coconut milk products? What’s your favorite Olympics event to watch? I’ve been doing a lot of pre-scheduled posts lately because I am actually in the process of moving! Well obviously not just me but my mom, dad and sister too. I don’t want to go into too many details about the move, but it’s not really major since we’re just moving about 20 miles from where we are now. It’s kinda bittersweet, though, since I’ve lived in this house since I was 12 and I’m in love with everything about the house, especially the location (it’s in a forested area that’s pretty quiet and secluded but gorgeous and nature-y). But since I’m now spending most of the year living in my college town, my sister’s off to college in two years and all the crappy bad economy stuff going on, my family’s downsizing and moving into town to save money on gas and house costs. It definitely makes sense but it’s gonna be hard getting used to sharing a bathroom with my sister and having a smaller kitchen! Enough with the boring stuff, let’s move on to WIAW! I’ve been kinda slacking on the photo taking with all the packing and moving shenanigans I’ve been involved in but I have some random food pics that all have something in common–weird combinations. Sometimes I experiment and combine really strange foods together and it actually works out! 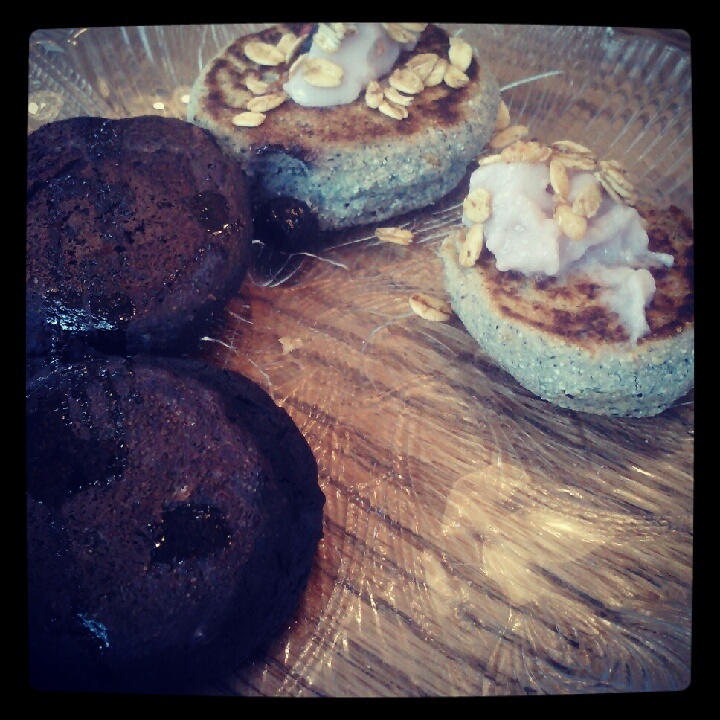 Breakfast: peanut flour brownie batter pancakes, blue corn blueberry pancakes with Amande blueberry almond milk yogurt and granola. Pancakes–normal. But pancakes made with blue cornmeal? I decided to try out the blue cornmeal I bought to make quinoa cornbread in some mini pancakes. I mixed the cornmeal with oat flour and added some blueberries into the mix. They actually turned out tasty and had a different texture than typical pancakes. The almond milk yogurt on top was my first experience with nondairy yogurt and it was pretty good, but the texture is definitely different. It’s got a lot of calcium though–30% DV–which is always something I’m trying to get more of. Lunch: multigrain pizza pita bread, baby carrots, green chile hummus, kalamata olives, artichoke hearts with nooch, tamari pumpkin seeds. I was going for a Mediterranean-inspired lunch snackplate here. The tamari pumpkin seeds kinda threw that off since they’re more Asian though. The pizza pita bread was from some leftover Whole Foods multigrain pizza dough that I cut into thin-ish pieces. The hummus also isn’t really Mediterranean, and it’s not my favorite hummus either. 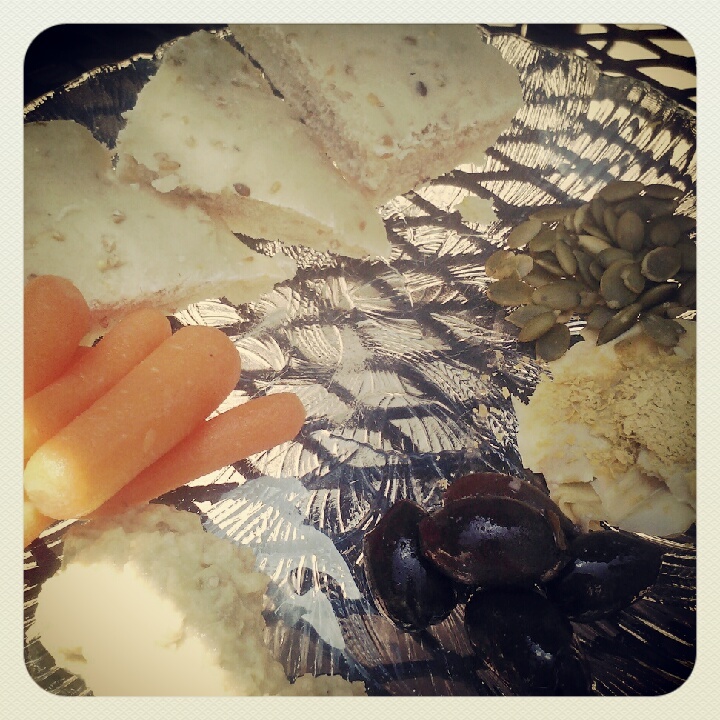 I’m still on the hunt for the perfect hummus that I can pair with anything…any suggestions? 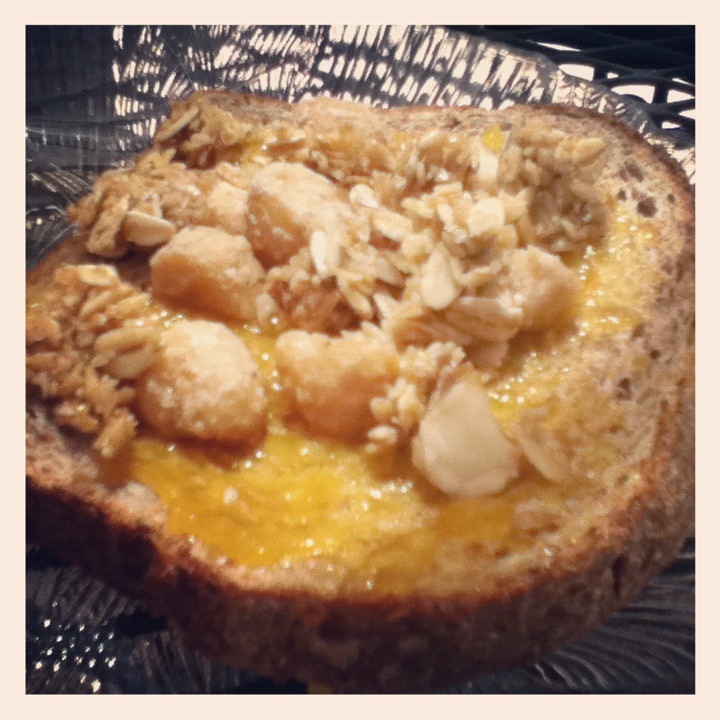 Alvarado Street sprouted sourdough toast topped with Crofter’s mango jam, sunny “raw”nola and maple macadamias. This was kind of a tropical take on toast. The mango jam is the best jam I’ve ever had and it went perfectly with the macadamias and granola pieces. Kinda weird to have crunchy things on toast but I don’t care, it was delicious. Dinner: spicy mac ‘n cheez (quinoa pasta, spicy nacho cashew cheez sauce, Mexican chipotle Field Roast vegan sausage), random kale salad with Bragg’s aminos/lemon juice, nooch, raisins and sunflower seeds. 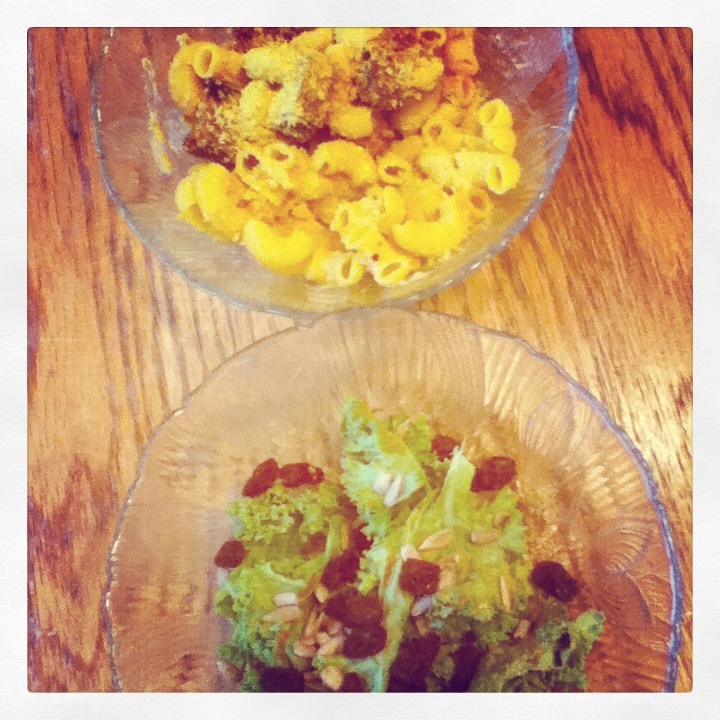 The mac ‘n cheez isn’t the weird part, the kale salad is. I really don’t know how I came up with this combo but it worked. I took raw kale, massaged lemon juice into it, spritzed it with Bragg’s liquid aminos, dumped nooch on top and sprinkled on raisins and sunflower seeds. Completely random, but totally winning. What are the weirdest food combos you love to eat? Have you ever tried almond milk yogurt? So I decided to make it my goal this summer to try to post at least one recipe per week. I’d really like to do a weekly recipe round-up of all the recipes I’ve made in that week but that probably won’t be happening, since I have a lot of recipe mishaps. Most of the things I make are at least edible, if not yummy, but sometimes they don’t turn out as well as I hoped they would and I don’t post them because they aren’t amazing. Like the sour ‘cream’ and onion kale chips I made last weekend. They weren’t half bad and I loved how the dehydrator made them perfectly crispy, but the flavor wasn’t exactly reminiscent of sour cream and onion. This “raw”nola on the other hand is delicious. 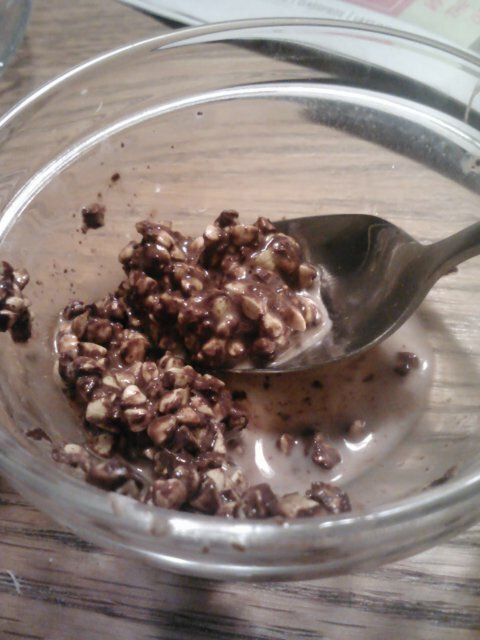 It’s got just enough sweetness with a touch of nuttiness and I like that it came out in huge clumps. 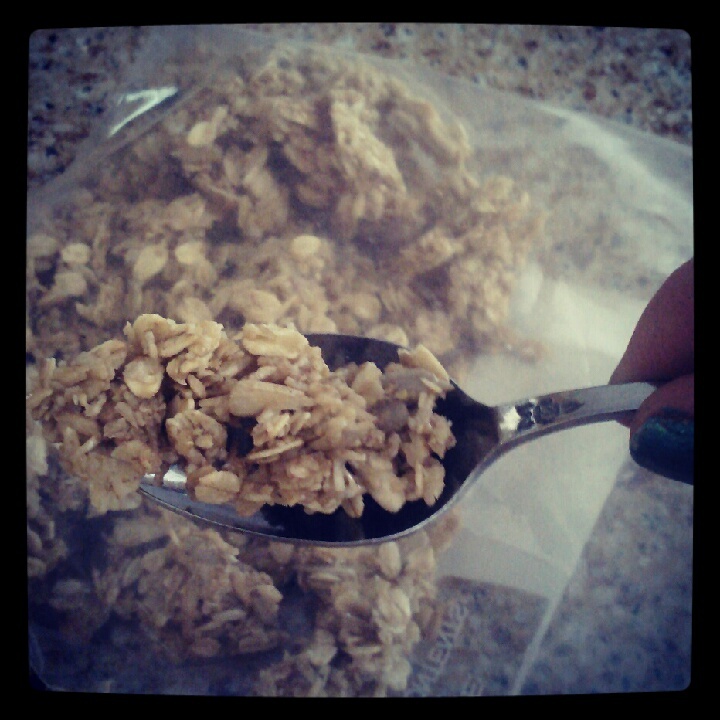 The clusters are always my favorite part of granola! Plus it’s (mostly) raw and has only 5 simple ingredients. And it’s so easy a 4 year old could make it. Mmmm, look at those clusters! In a large bowl, stir together the oats and seeds. Add the almond butter, agave and salt until they coat the oats and seeds and form a sticky mixture. Spoon large clumps onto a lined dehydrator tray (I used a round wax paper cut-out) and spread out until granola is about 1/2 inch high. Dehydrate for 4-6 hours, then set granola out to air dry for 1 hour. Store in a plastic bag/container or enjoy with almond milk. Makes about 2 cups. What’s your favorite granola flavor?